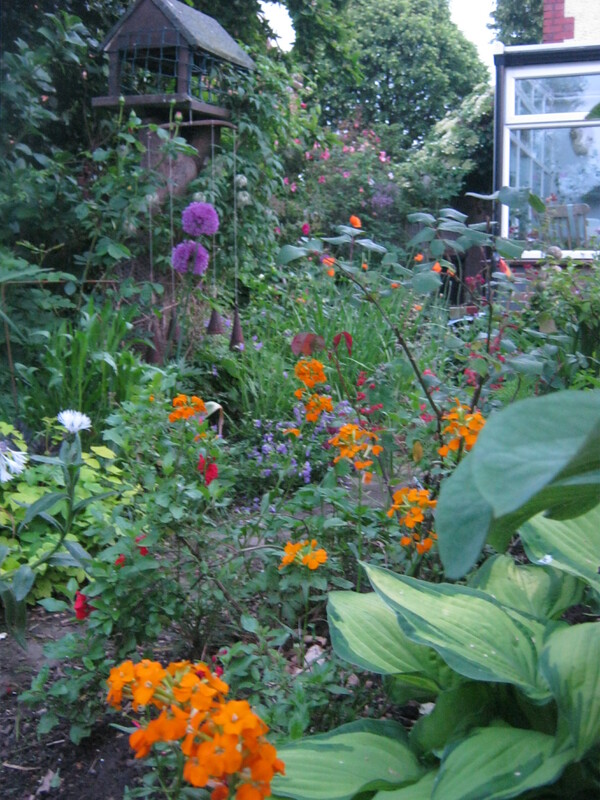 We have had some really heavy downpours over the last few days, but the garden has rewarded me with some lovely lush photos. Taken last evening about 9-00. Actually a view of the summer house but you wouldn’t know it . 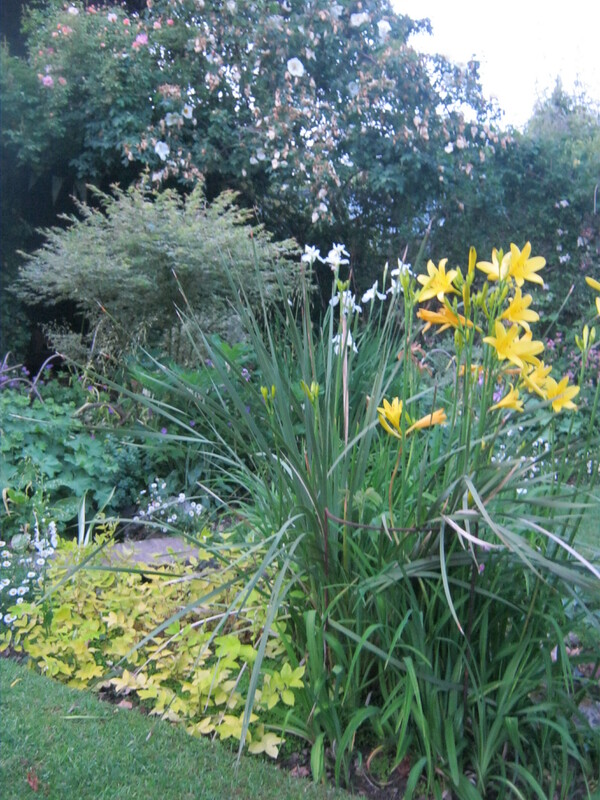 An unnamed Acer in the background, Hemerocallis citrina very fragrant, and Filipendula ulmaria ‘Aurea’, with a dierama to follow later in the summer. 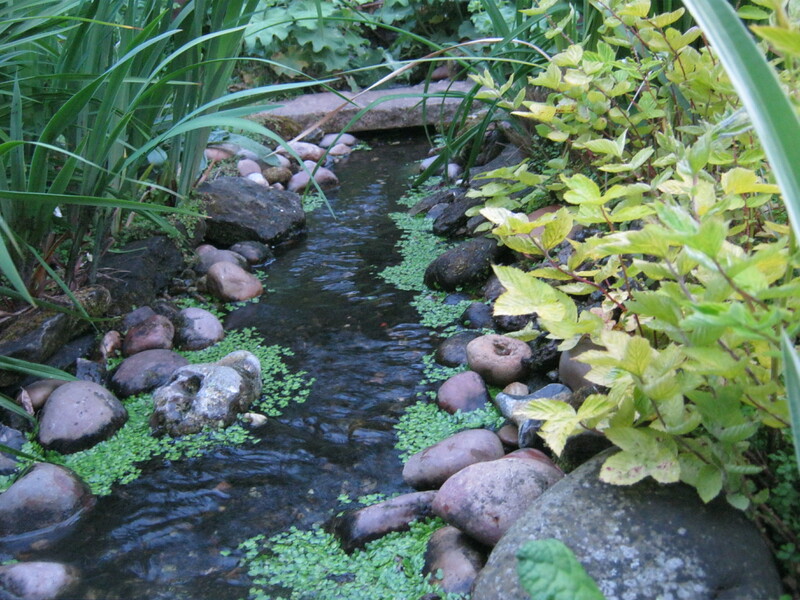 The rill that joins the two ponds, looks like a river but it’s only about 40 cms wide. 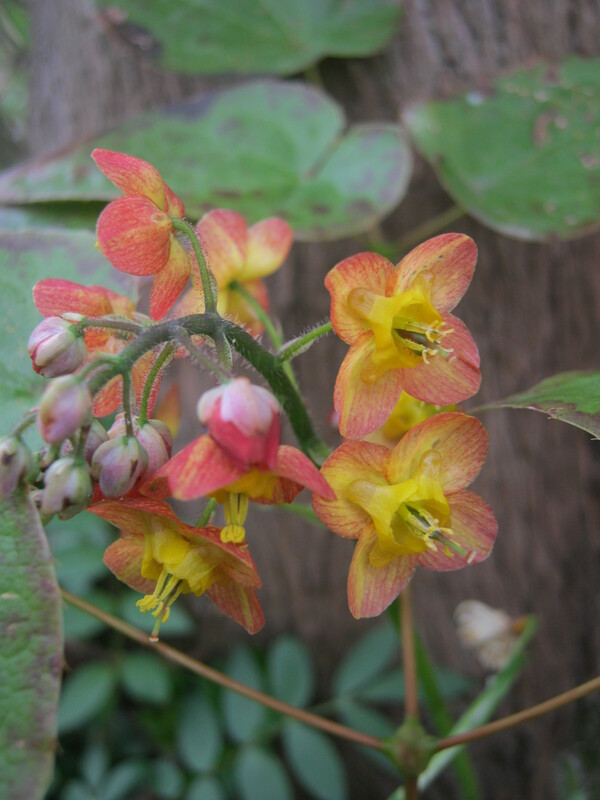 A wallflower linking with the Papaver rupifragrum ‘flora plena’, Plant World seeds. 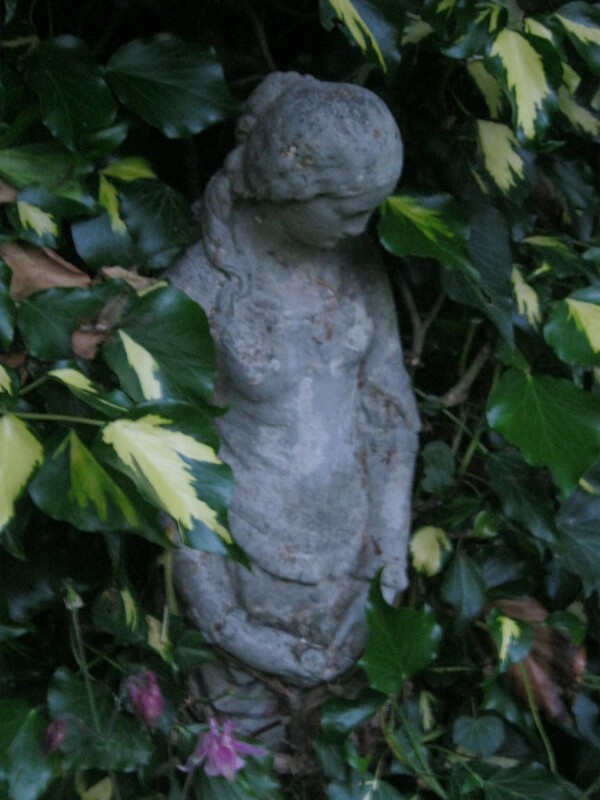 Lady watching over the fish in the top pond. 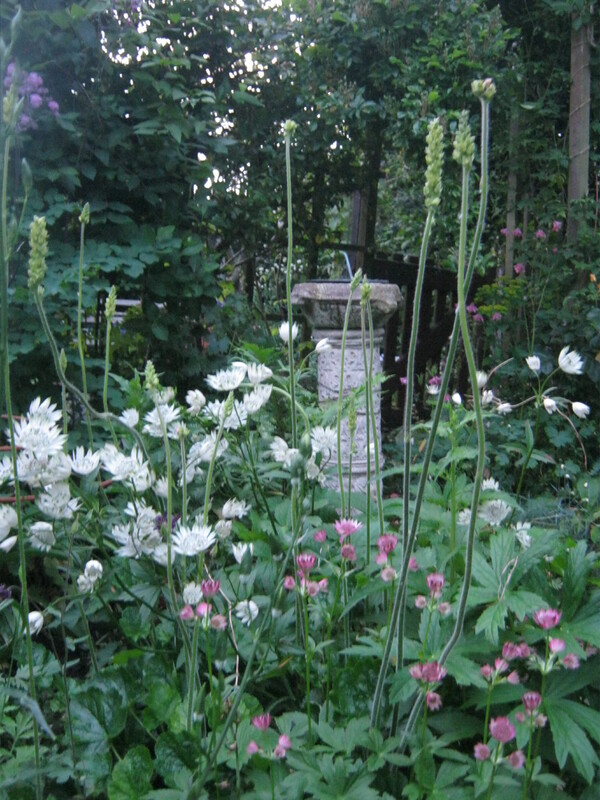 Astrantia ‘Shaggy’, ‘Roma’, and Heuchera ‘Greenfinch’, under the sundial. 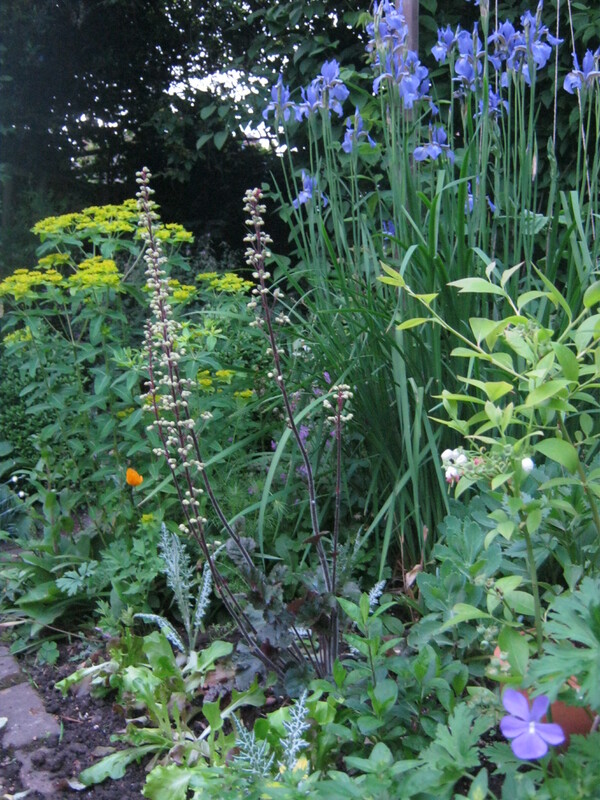 Heuchera, Iris Sibirica,and Euphorbia with a resent addition of a mixed lettuce edging, probably going to be snail food ! Today things seemed to have taken a turn in the garden. 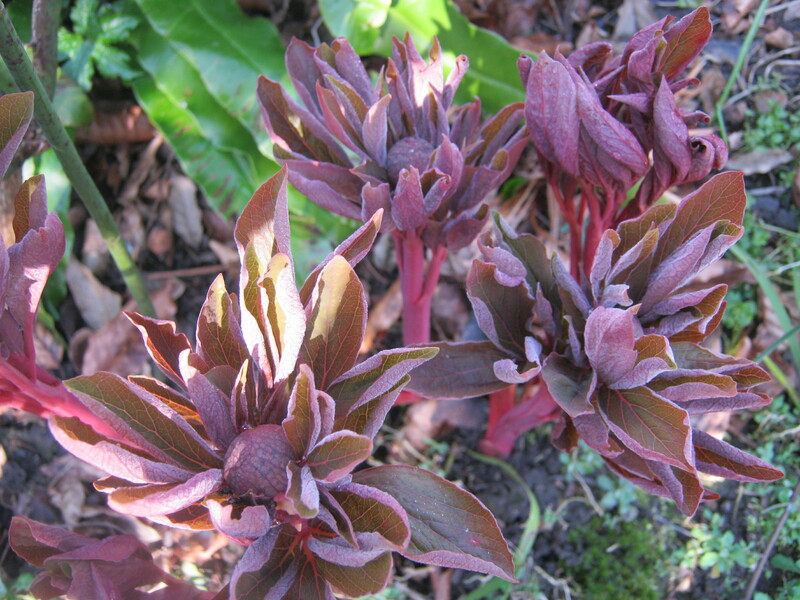 New leaves are unfurling everywhere and the ground is erupting with the promise of summer abundance. Always the first peony to flower here and so welcome. Always have to watch for lily Beetle. 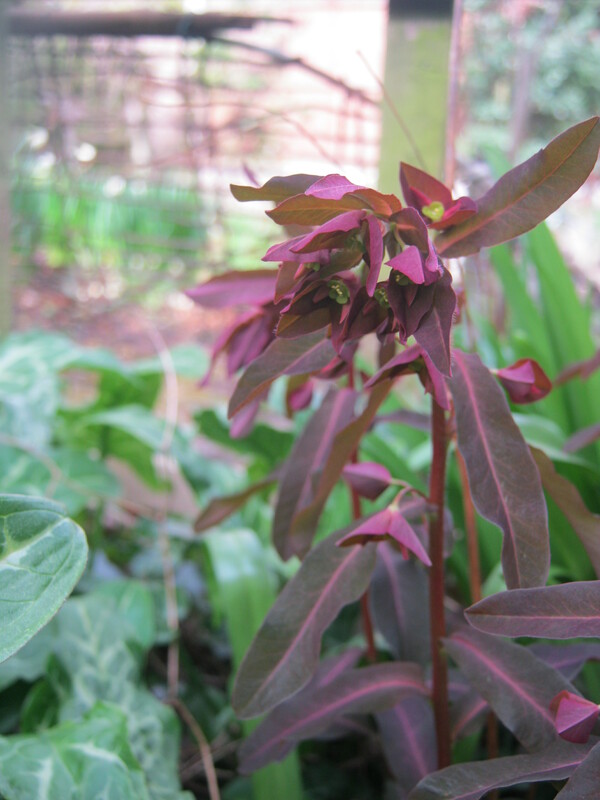 A lovely spring ground cover, with leaves tinged purple/red. Not to everyone’s liking as it can spread, but the spring colour is stunning. 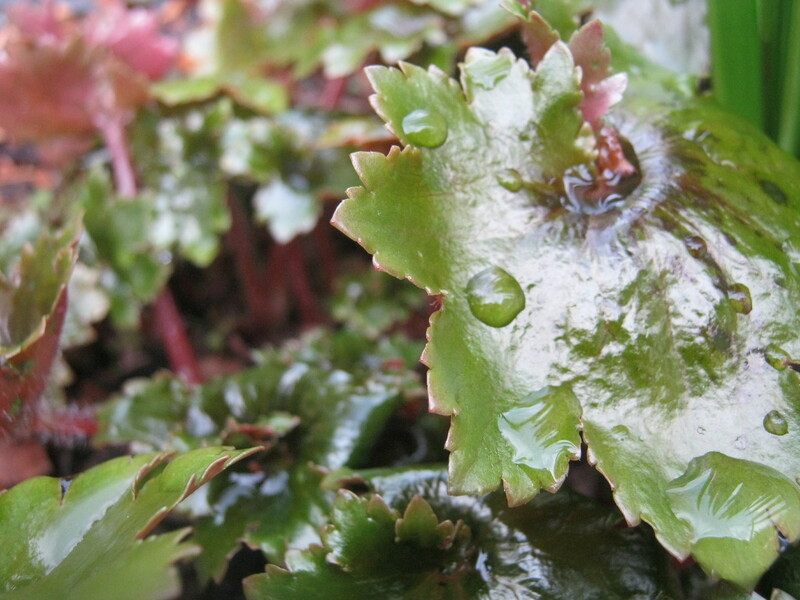 Glossy, always healthy, green leaves with a deep maroon underside. An impressive plant all through to autumn. 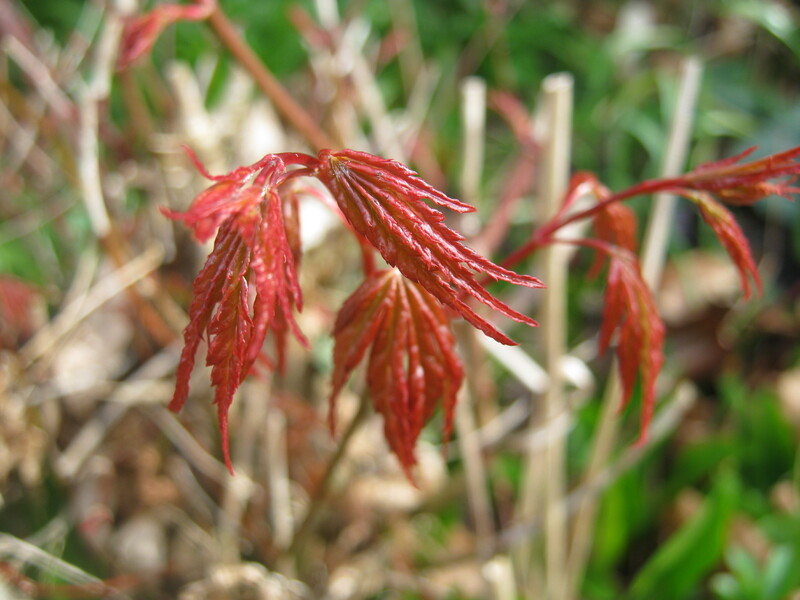 Acer….now unknown as I cut the original down and this is the graft that grows. I like it much better. 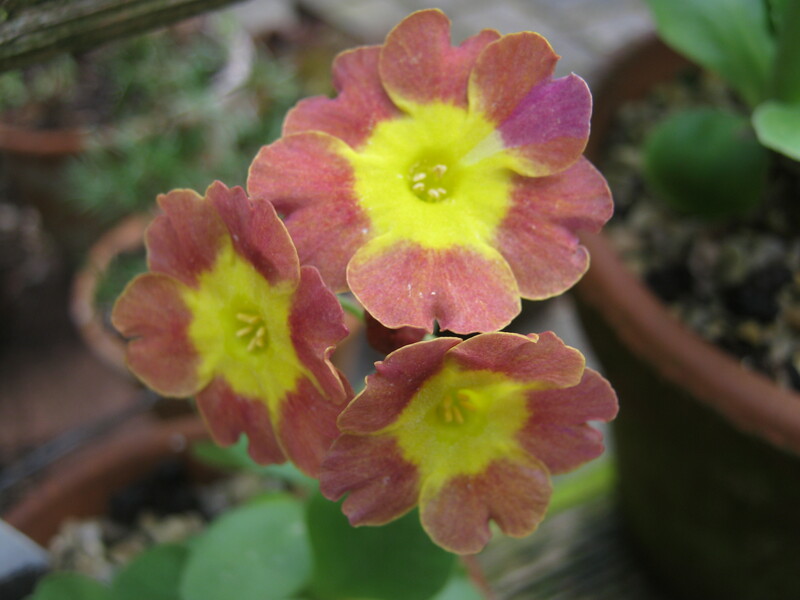 A seedling Auricula not a good specimen, but I will keep it all the same. 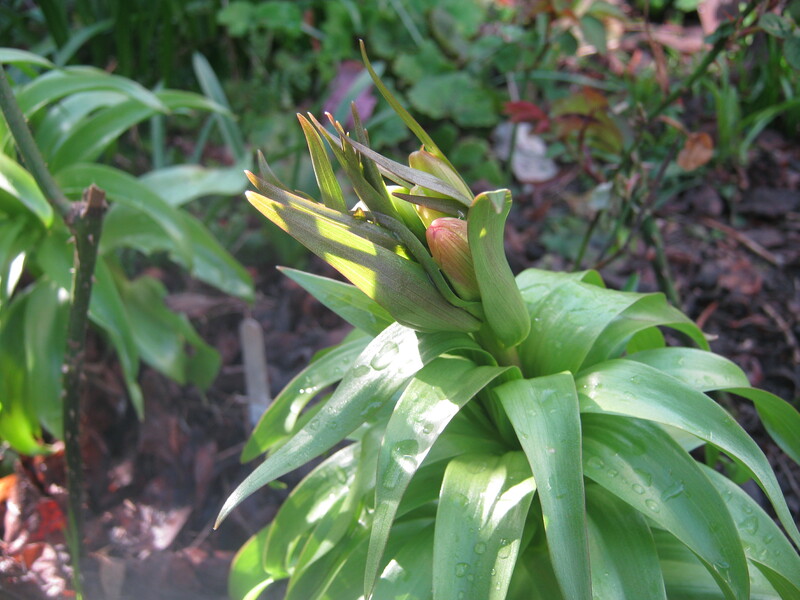 I always get such a buzz from seeing all the new growth in the spring, it’s almost worth going through the winter for it….